The image that Caravan Of Thieves use to describe their music speaks clearly: "If Django Reinhardt, the cast of "Stomp" and the Beatles all had a party at Tim Burton's house, Caravan Of Thieves would be the band they hired". Grown around the husband/wife duo featuring Fuzz and Carrie Sangiovanni, the Connecticut-based band put on stage an overwhelming bacchanal with gypsy feeling, swing echoes and macabre fascinations. After the release of their second album, "The Funhouse", we asked Fuzz and Carrie to tell us the very personal philosophy of Caravan Of Thieves. Caravan Of Thieves started as an acoustic duo: could you tell us something about that period of bohemian life? The two of us were just starting to get to know each other, both personally and musically. We had just started dating but it was an exciting and serious relationship right from the beginning. So the music had lots of passion, emotion and we had a lot of fun together making music. We would go outdoors to parks, on the streets, festivals, anywhere we could, and just play. It was always a social setting so this effected how we wrote and performed, to always be involved in some way with the spectators. What did you learn from your street performance experience? We learned how to quickly get the attention of people passing by, both from what we experimented with in our presentation and from what other street performers were doing nearby. Some were great at it, especially the break dancers in New York City. How today's band line-up was born? The two of us performed at the University of Hartford in Connecticut and Ben Dean was playing violin in the other band that night. We asked him to join us on a few songs, then a few gigs and just kept going from there. Once we had the concept for Caravan Of Thieves we asked Ben to join. We also thought a solid and an energetic upright bass player would be essential, and Brian Anderson was a local Connecticut musician we knew from the scene so we asked him to join. It clicked right away with the four of us. When did you fall in love with the sounds from the swing era and the gypsy music? 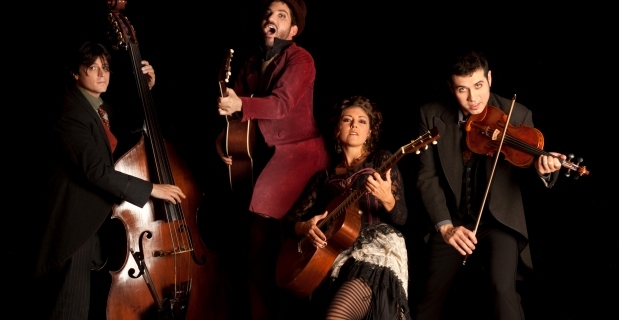 Fuzz: I have been a fan of 1930's swing and gypsy jazz for about 15 years now. But before Caravan Of Thieves, I played mostly electric guitar in R&B, blues, rock and funk bands so it was never relevant until four years ago when we started this. Once Carrie and I decided to keep things acoustic and add violin and upright bass to have a similar instrumentation as the Hot Club of France, we really dove into the style more... swing, gypsy, etc. Carrie: Although I had heard the music in movies and in passing I really fell in love with this music when Fuzz formally introduced me to it after we met and even more so when we decided to use it as a major influence on our writing. How was the recording process of your new record, "The Funhouse"? We went into the recording studio with the intention of capturing the live energy and feel of the band and we feel we have essentially achieved that. But we also experimented a bit and added a few new sounds and ideas that were not part of the live performance. Ukulele, banjo, resonator guitar, pots, pans, buckets all added to the overall color. We also invited fans, family and whoever we could into the studio to create some of the live atmosphere of the show and do some singing, stomping and clapping, especially on tracks like "Raise The Dead". What difference do you feel from your debut album, "Bouquet"? With "The Funhouse", we feel we have taken our sound, songwriting and performance to a new level since the time we recorded "Bouquet". "Bouquet" captures the original concept in its earliest form (we went in to record that album only being a band for 8 months) so it has a certain magic too it. But we are always looking to refine and improve what we do and "The Funhouse" both lyrically and musically seems to be sharper, more colorful, and a more realized sound. In the new record there's also an "orchestra of kitchen appliances": what's the weirdest thing you used (or you would like to use) as a percussion? We think our favorite was the foot stool. It appears on "Eat You" in the choruses as marimba or wood-block type of sound. The concept of "The Funhouse" is about life as an amusement park, where happiness and fear are always mixed. For you what's the way to live without being scared of living? We like to live each day as if it could be your last, accept that truth, accept death is inevitable. But never dwell on it. There's so much beauty in the world, you just have to know where to find it. It's not in the stuff being sold to us day to day, it's not in money, success, power or fame. It's in our hearts and the hearts of others, in nature, in real world outside of the cities and human development, what little is left of it. In your songs there's a lot of macabre images and black humour. Can horror stories be a sort of metaphor of life? We feel life will always contain just as many pleasant moments as it will horrific moments. So that metaphor or actually, reality exists all the time. But the black humour or satirical approach is how we make it entertaining to listen to. It's how we see it as art. It's our interpretation of the horrors of life. Yes, they are there. We can't avoid them, so we might as well stare them in the face and then laugh at them. Speaking of mystery, if you could call up the ghost of an artist from the past, who do you choose? We seem to have a few we call on from time to time... Frédéric Chopin, Django Reinhardt, Duke Ellington, Emily Dickinson... are a few on our speed dial. Did you enjoy the making of the video for "Raise The Dead"? Yes, it was a truly fun and unique experience. Nice to see all the supporters who joined us in the making. Not only supporters of our band and music but supporters of the concept, dressing up, being creative and acting out the characters. Many of the costumes, designs, makeup, etc. were all things our fans, friends and family brought to the set. And the 300 year old cemeteries and turn of the century vaudeville theater we used for locations were magnificent. Your shows are very theatrical, you also wear old fashioned outfits on stage... How do you live your relationship with live performances? We like to see the stage and performance as a place to live out our alter egos, our fantasies. We think the stage should always be an exaggeration of life, bigger, louder, more colorful, even more ridiculous at times. It's what makes it entertaining. Something you'd want to go to see. Your songs often change live. Do you like to reinvent your music? Our music, sound, concept, songs are constantly under revision. Never finished. We think a healthy artistic approach is to not be afraid to change or discard ideas, even after they've been recorded and put out into the world. Plus being at a live show and listening to an album on your headset are two very different experiences. What we do in the studio doesn't always translate to the stage and viceversa. A room full of people, that energy, what people want to feel in a live setting is usually more dynamic, interactive, emotional and visual based so if we have to alter arrangements to bring those elements into to picture more, that's what we do. You like to play unexpected covers, such as Queen's "Bohemian Rhapsody" or Michael Jackson's "Thriller". What's your favourite song from another artist to play? And for you what's the key to really make someone else's song your own? We really enjoy playing "Psycho Killer" by Talking Heads. Mainly because we have a close and personal relationship with two of them (Tina Weymouth and Chris Frantz). Plus it's such a fun musical rearrangement for us and the lyrics are dark, yet comical at times. We go into covering a song with the idea that it's going to have to change drastically. It's why we pick songs that sound so different from us. Most do anyway. So we have that opportunity to make big changes: tempo, feel, chords, even melodies at times. The songs we choose to cover still have to have some elements relevant to Caravan Of Thieves, whether the lyrics are a bit cynical, the music has classical or jazz harmony, things like that. We learn every aspect of the song, then start taking it apart, piece by piece and putting it back together with a swing feel, gypsy feel, arrangement for acoustic quartet, violin, etc. If you could use a time machine, which year (and place) would you choose? We feel living in Vienna late 1700's early 1800's would have been quite a time and place for music and art. Would be great to meet Beethoven, even if he was rude to us. To make a new album, some time within the next 6 to 12 months. Build a bigger and better stage show, more junk to bang on! And tour more, hopefully more outside of the United States, Europe, Italy even? Fuzz: I have family ties, my grandparents came to New York from Naples and Sicily, maybe I can find some long lost relatives! As we're waiting to welcome them sooner or later here in Italy, Caravan Of Thieves accepted to give to the OndaRock readers their surprising cover of "Bohemian Rhapsody" as a free download: the best invitation to their haunted amusement park.